Jedi Training: Trials of the Temple (previously known as Jedi Training Academy) is a guest experience based on the Jedi teachings found in the Star Wars series, located next to Star Tours–The Adventures Continue in the Echo Lake area at Disney's Hollywood Studios, at the Tomorrowland Terrace in Disneyland, inside Videopolis in Discoveryland at Disneyland Park Paris and at the original UFO Zone area in Hong Kong Disneyland. The original version, Jedi Training Academy, closed at Walt Disney World on October 5, 2015, and reopened as Jedi Training: Trials of the Temple on December 1, 2015, with new characters from Star Wars Rebels. The Disneyland version closed November 15, 2015, and reopened as Jedi Training: Trials of the Temple on December 8, 2015. The premiere at Hong Kong Disneyland opened in June 25, 2016, as part of its 10th anniversary celebration. 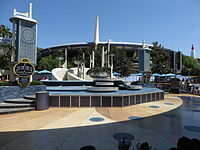 In the original version, sixteen or more children sign up for each session at the beginning of the day to be Jedi Younglings and participate in a training session by the Jedi Master. They are provided training lightsabers and Jedi robes. As the master completes the instruction of a simple combination of lightsaber attacks to the children, Darth Vader, Darth Maul and two stormtroopers appear. Each Jedi trainee can choose face off with either Maul or Vader until everyone has got to fight a villain, which is when the villains retreat back to the stage, outnumbered (the trainees on the stage fought Vader, while those on the ground fought Maul). After Vader and Maul leave through a door on stage (in Disneyland, the stage raises and lowers Maul and Vader instead of them going through a door), the stormtroopers try to flee as well, but the door is closed because Vader and Maul left a little before they tried to flee, and the master uses the Force to open the door to let the stormtroopers leave. The children, now Padawans, are congratulated on their mastering of the Force by Yoda, then return the training lightsabers and robe, and are given a diploma for their participation. In Jedi Training: Trials of the Temple, the group again goes through the training with the Jedi master (Vanzell Mar-Klar) and a Jedi Apprentice (Nedriss Narr). Then, the group uses the force to open the doors to the Temple. Darth Vader comes out, followed by The Seventh Sister. Each trainee on the upper platform fights Vader, while each trainee on the lower platform fights The Seventh Sister from Star Wars Rebels. After each trainee has faced off with a villain, Vader and The Seventh Sister turn to leave. Right before they would go through the doors, they turn around to seemingly fight again. The Jedi master then leads the trainees in using the Force to push The Seventh Sister and Vader back into the Temple. Darth Maul then comes out of the Temple and begins a fight with the Jedi Apprentice. Yoda then speaks to the Apprentice, who had previously been trying to stay out of the fight. The Apprentice then battles and defeats Maul. Right before killing Maul, the trainees tell the Apprentice to stop. The Apprentice lets Maul live, and Maul goes back into the Temple. Maul comes back out and the trainees once again use the Force and push Maul back into the Temple. Trainees then return the training lightsabers and robe, and are given a diploma for their participation. On February 21, 2016, Kylo Ren replaced Darth Maul at Disney's Hollywood Studios. At Disneyland, Kylo Ren made his first appearance in the show, replacing Darth Maul, on March 5, 2016. On September 17, 2017, Kylo Ren replaced The Seventh Sister in both parks. Jedi Training Academy originally was a part of Star Wars Weekends and only took place during it. While it is now being featured daily throughout the year, it was especially popular during Star Wars Weekends. Jedi Training Academy has been offered at the Star Wars Celebration convention, as well as the D23 Expo. From July 4–19, 2015, Jedi Training Academy took place at Hong Kong's iconic Times Square as Jedi Academy (Traditional Chinese: 武士學堂). From August 6–20, 2016, Jedi Training Academy took place at Japan's Fukuoka Prefecture, Tokyo and Osaka Prefecture as Jedi Academy (Japan: ジェダイ・アカデミー). Wikimedia Commons has media related to Jedi Training Academy. ^ a b "Jedi Training: Trials of the Temple | Disney's Hollywood Studios". touringplans.com. Archived from the original on November 13, 2015. Retrieved January 4, 2016. ^ a b c d e "Jedi Training Trials of the Temple – Disney's Hollywood Studios". allears.net. Archived from the original on January 21, 2016. Retrieved January 4, 2016. ^ "Jedi Training Academy to close at Walt Disney World, to reopen as "Jedi Training – Trials of the Temple" later this year". Inside the Magic. Archived from the original on January 4, 2016. ^ "Jedi Training: Trials of the Temple | Disneyland". touringplans.com. Archived from the original on March 5, 2016. Retrieved January 4, 2016. ^ "Season of the Force Begins November 16 at Disneyland Park in California". Disney Parks Blog. Archived from the original on January 8, 2016. ^ "It's official: The Jedi Academy opens at Disneyland Paris". Disneyland Paris Press News. Archived from the original on March 4, 2016. Retrieved January 4, 2016. ^ a b "Jedi Training: Trials of the Temple". Walt Disney World. Archived from the original on January 15, 2016. Retrieved January 4, 2016. ^ "Jedi Training: Trials of the Temple". Disneyland. Archived from the original on January 23, 2016. Retrieved January 4, 2016. ^ a b "Jedi Training Academy". Disneyland Paris. Archived from the original on January 14, 2016. Retrieved January 4, 2016. ^ "Hong Kong Disneyland Reports Second-highest Revenues, Third-highest Attendance and Record Guest Spending". Archived from the original on March 11, 2016. ^ "Jedi Training: Trials of the Temple – full show at Disney's Hollywood Studios". youtube.com. Attractions Magazine. Archived from the original on March 25, 2016. Retrieved December 2, 2015. ^ "VIDEO: Kylo Ren invades "Jedi Training: Trials of the Temple" at Disney's Hollywood Studios!". Inside the Magic. Archived from the original on February 24, 2016. ^ "Kylo Ren now appearing in Jedi Training at Hollywood Studios". Orlando Attractions Magazine. Archived from the original on March 18, 2016. ^ Jedi Training Academy at Star Wars Celebration. April 25, 2015 – via YouTube. ^ "We're All Kids at Star Wars Celebration". D23. Archived from the original on September 21, 2015. ^ "YOUNGLINGS, ENROLL NOW: DISNEY'S JEDI ACADEMY COMES TO HONG KONG". Archived from the original on February 6, 2016. ^ "この夏、あなたもジェダイ騎士になってみないか！！『スター・ウォーズ』ジェダイ・アカデミー、参加者募集！" (in Japanese). Archived from the original on July 8, 2016.